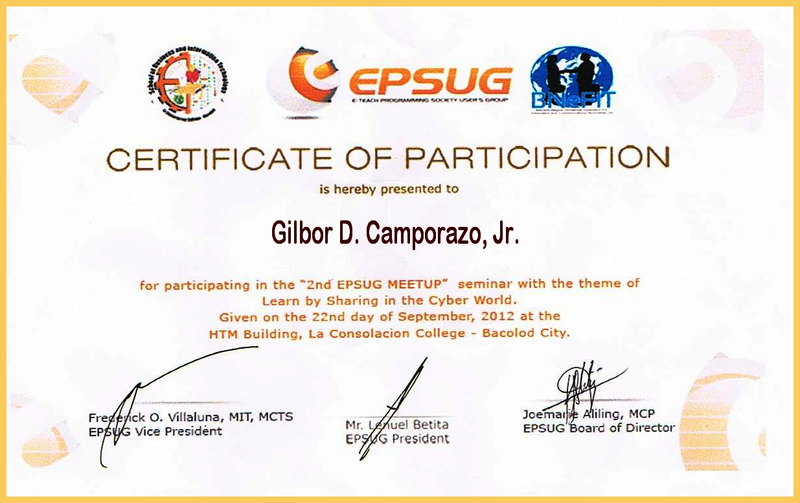 Our youngest son, Gilbor D. Camporazo, Jr. and his co-ed, Champ Jun Cañal, 2nd year programming students of LaSalTech, La Carlota dared to prove their worth in the 2nd E-TEACH Programming Society Users Group (EPSUG) MEETUP seminar recently at HTM building, La Consolacion College, Bacolod City by showing their best on what they've learned and experience from their technology education. For the first time, they did represent their school in this "meetup" of future expert programmers in the country. They're excited. They're nervous. But they're determined as ever and have the notion to excel whatever matters for the honor of their school. What actually led them to join with this seminar of would-be programmers to experience the first-hand instructions, lecture and applications of high-level programming techniques and procedural codes from experienced and expert resource persons. A lecture on blogging, on animation using autodesk Maya and Maya application, robotics, among others preceded the web design competition. 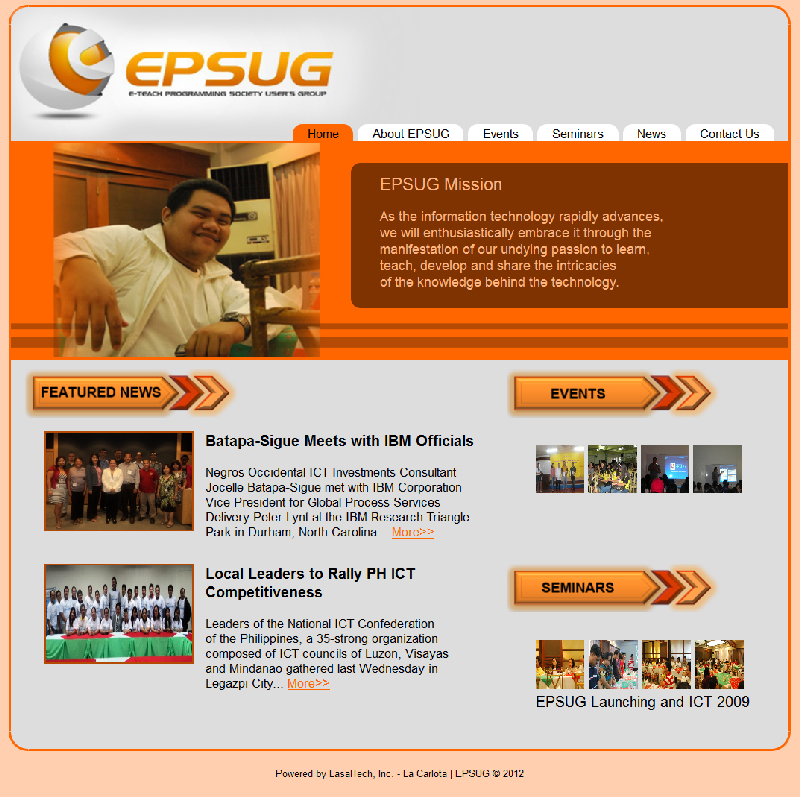 Determined, they participated in on-the-spot webpage design contest. Though, they had not won in the said contest, but they severally and jointly exerted their efforts to do their best, to muster the available programming skills they've had. 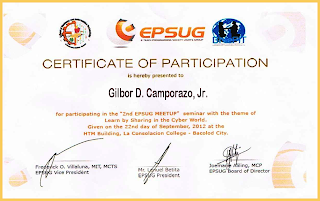 Gilbor Junior, who had just recently passed the procedural programming and received the certificate of competency, did most of the program code by using HTML 5, Java Script with JQuery to emphasize the slide effect on the banner section of their design, and CSS 3. 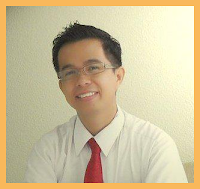 Since they're neophyte on this kind of programming competition, they didn't prepare so much for web development. They're left behind as to the programming and web development skills as compared to their fellow contestants like La Salle-IT, Bacolod who were well-prepared and had all the resources to enrich and enhance their design. Sad to note, they're just contented of their limited sources and common sense. At least they did their best. That's a good try for both of them. Anyway, they're already a winner for themselves for they've participated in, for they've wholeheartedly and willingly represented their school. In apparent reason, lack of preparation. Out of more than 360 Information Technology participants, Gilbor Junior and Champ Jun are peculiar and I salute them for their determination and will power to be among those who will come out as winners if possible. But due to limitations as I mentioned, they came short of their expectations and lost the contest. 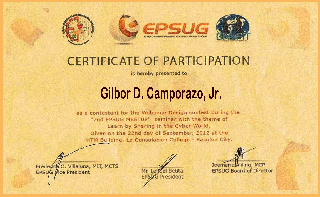 The only recognition they received was a certificate of participation duly signed by ESUG President, Lenuel Betita; ESUG Vice President Frederick O. Villaluna, MIT, MCTS; and Joemarie Aliling, MCP, EPSUG Board of Director. Someday, they could make it. Viva LaSalTech, La Carlota! More power! Nice! Congratulations to your son! 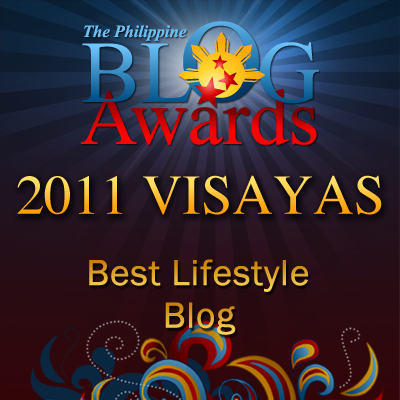 :) It looked like a well-deserved award. It's good that they have web programing competition now even at a young age. The technology is really fast moving up. Congrats to your son. Great effort for your son and I'm sure he gained a lot of experience despite not winning. winning is not always having to get a favorable end - in losing, one learns a lot too! Well, congratulations! There's always a next time. Joining the competition sometimes matters more than the winning because of the experience obtained from it no matter the results. Congratulations nonetheless, I have a great deal of respect for programmers who, like your son, use more of their common sense to survive in their field. Programming is a very difficult field of expertise but your son seems to be enjoying it. Congrats to your Son, such a great feat. What a happy and proud parent you are :) . Congrats to the achievement of your son Sir. What a happy and proud parent you are :) . Congrats to the achievement of your son Sir Gil. Like father like son. Congratulations to your son. Congratulations to your son! He's still the winner!